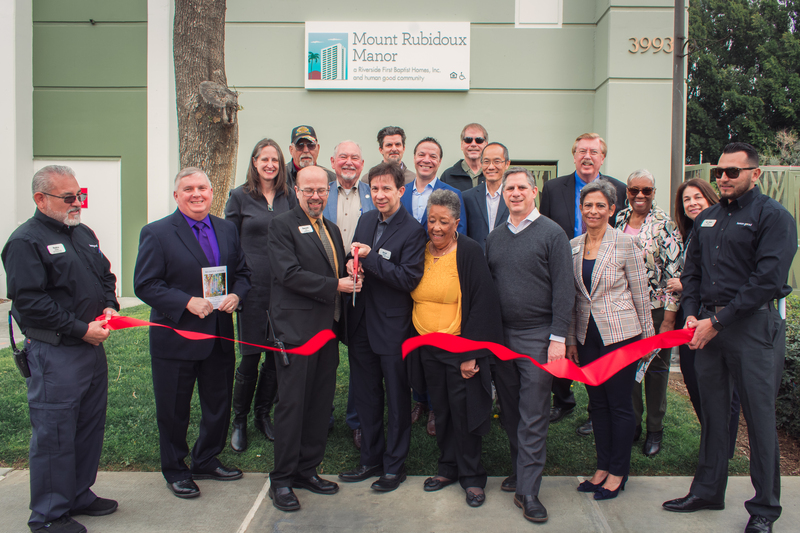 Mount Rubidoux Manor residents, team members and special guests celebrated the newly renovated affordable housing community in Riverside. The 188-unit, 16-story residence, originally built in 1970, underwent an extensive renovation totaling $35 million. The renovations included a new roof, exterior paint, energy-efficient central air system and boiler, converting an old commercial kitchen into new office space, and upgrades to the community recreation and social service areas. Our residents’ apartments also have new kitchens, bathrooms, dual-pane windows, air conditioning units, lighting and upgrades to meet ADA compliance. Construction at Mount Rubidoux manor was completed in November 2018. The community was renovated in partnership with Riverside First Baptist Homes, Inc., a co-sponsor of the community. Development and construction was overseen by Beacon Development Group, a subsidiary of HumanGood. With our affordable housing team, Beacon Development has facilitated the funding, design, construction and renovation of several HumanGood affordable housing communities. HumanGood affordable housing owns and manages about 59 affordable housing communities located in California and Washington state. Among our other key partners on the project include: Citibank, N.A., Alliant Capital, Ltd., and Walton Construction, Inc.